My son is obsessed with construction equipment, like a lot of little boys but he is especially fond of any kind of Skid Steer loader and the yellow Caterpillar version most of all. I was planning on making something wearable but as I got started I realized that it would be too heavy and awkward even making it out of the most lightweight materials. Plan b was the build something he could ride in and that is what I ended up doing. I modeled it in Sketchup and got to work. It is constructed almost entirely of 1" rigid foam insulation attached with spray adhesive and the odd screw here and there. I designed it to slide over and existing stroller and it worked out perfectly. It turned out great and he loves it. We got a lot of looks and waves and thumbs up driving it around. That particular stroller ( http://babyontrip.com/wp-content/uploads/2012/08/chicco-liteway-umbrella-stroller-reviews.jpg ) was perfect because of the shape. I added a 2nd layer on the slope that aligned with the angled bar of the stroller and then the same thing going the other direction. I ended up with an "A" shape that just slid over the stroller and wasn't actually attached. Hopefully that makes sense... I'd take a picture but I've since scrapped that thing. Good luck! Sure, I put together an instruction with all the drawings etc. and a pretty detailed step by step. Are you selling this skid loader material attachable to a stroller? Thanks. I would appreciate your response. I am not selling it, I've since tossed it. I did put this together if you want to build your own it has a lot of info and drawings etc. I am not seeing the instructions with the drawings on this. Any way you can send them to me or post then again? I'm very interested in making this for my son this year but I don't know how to make it stay off the ground without it being over a stroller. Also, how did you tranport it in a car? I have tried twice to post the link to the instructable and they keep removing it. 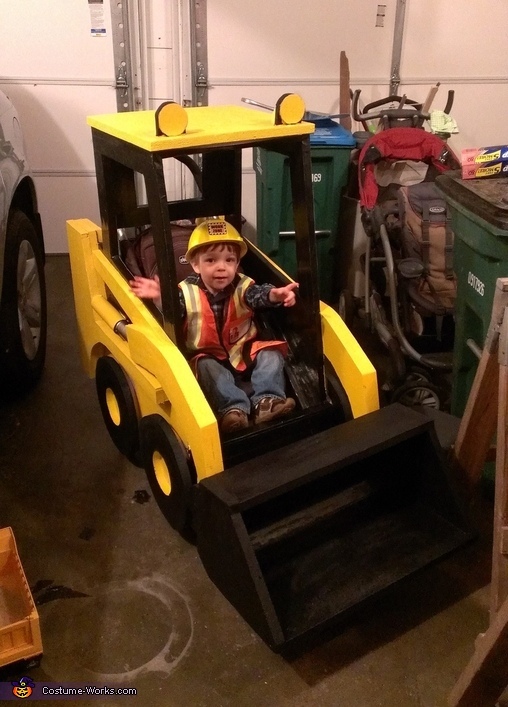 Search for skid steer costume instructable on Google and you should see it. I think you could pretty easily adapt it to fit on a wagon. As far as taking it in a car... I have a Honda element and it barely fit with the seats up. You could make the sides removable and /or reduce the scale. Have fun! Hello Matthew. I would love if u could help me I am trying so hard to find the print out for instructions on making this. Mostly the diagrams on what to cut out. Like the dimensions. Can u help please? Matthew can u post themail dimensions. When I print the layouts they don't print right.